Trump's right that there's a border crisis. But he's making it worse. Analysis: The president's moves are encouraging more Central Americans to try to reach the U.S.
President Donald Trump is right: There is a crisis at the U.S. border with Mexico. That wasn't the case when he first promised to build a wall in 2015, claiming Mexico was sending the U.S. its "rapists" and people who "bring drugs and ... crime." It wasn't true when Trump first mused about cutting off aid to Central American countries, vowed to close the border, shut down the government over immigration or announced that he would build his wall without Congress' consent. But it's sure true now. The federal government has been overwhelmed by Central American refugees arriving by the thousands. There are two reasons for that: Trump's policies sent the signal that this may be the last best chance to find safe harbor in the United States, and existing laws make handling migrants from Central America — as opposed to Mexico — much more complicated for the administration. "The system is full. 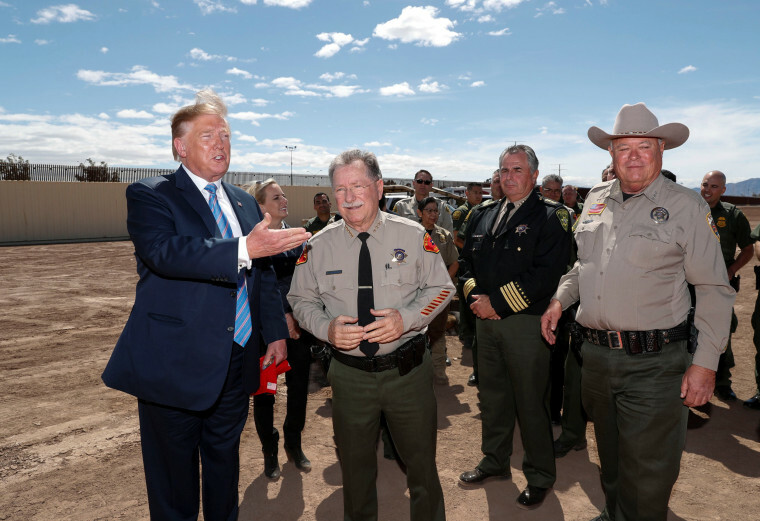 We can't take you anymore ... Our country is full," Trump declared during a public discussion with border security officials in El Centro, California, on Friday. "So turn around." Late last month, Homeland Security Secretary Kirstjen Nielsen sent a letter to lawmakers imploring them to provide more funding for the administration to deal with what she called a "humanitarian crisis," and to alter the law so that Central American children could be quickly reunited with their families and sent back to their countries of origin if they do not have a "legal right" to stay in the U.S. The difference in the treatment of Central American and Mexican minors — authorities can't send back unaccompanied kids from Central American countries quickly, like it can with children from Mexico — creates what Nielsen called a "pull factor" for migrants from Nicaragua, Guatemala and El Salvador. Trump's decision to suspend aid to those countries, his determination to build a wall and his grand gestures to demonstrate his desire to cut off illegal immigration are also incentives for migrants to get to the border as fast as possible. House Speaker Nancy Pelosi, D-Calif., called it a terrible idea to hurt the economies of countries that immigrants are fleeing. "Stiff competition, mind you, this is one of his worst ideas," she told Politico. Indeed, cutting off aid is what one might do to intentionally encourage more migration. Congress won't move quickly on Nielsen's request to change the law, in large part because it contains non-starters for the Democrats. Two senior administration officials told NBC News on Thursday that the president is expected to issue an executive order in the coming days that would be designed to ameliorate the humanitarian crisis, but neither was able to provide specific details about what the order would do. One of the officials said, separately, that the Department of Homeland Security sent out a solicitation Thursday seeking volunteers from agencies within the department to join a recent surge of forces at the border. Earlier this week, Nielsen directed authorizing between 700 and 2,000 department personnel to supplement the normal border contingent. All of the action points to a crisis. But even Friday, as his administration works to address what it is increasingly viewing as a humanitarian issue, Trump spoke almost exclusively in terms of drugs and gangs. He also spoke about the limitations of the military forces he's sent to reinforce border enforcement agents in dealing with migrants. "They rush our border and we have military and they are great military people," Trump said. "They can't act the way they would under other conditions and there’s not a lot they can do." In the past, Trump has said soldiers deployed to the border should consider rocks held by migrants to be the equivalent of rifles. It seems unlikely that he'll be able to solve a humanitarian crisis unless he stops creating more reasons for migrants to come to the U.S., and starts treating them more like human beings.